Talking parrots aren't unheard of. In fact, most pet parrots learn to pick up and talk some stuff from their owners. But thanks to humans themselves relying on technology themselves, parrots too are getting there. An African grey parrot named Sniper a resident of couple from Chandivli, Mumbai gives orders to digital assistant Alexa. Sniper has learnt to shoot orders and tells Alexa to play his favourite songs. He sits close to Alexa so he can give orders. Parrot Imitates Smoke Alarm Sound Perfectly! Firefighters Reach For Rescue in Northamptonshire. Shijin Francis and his wife Lily are owners of Sniper, the African grey parrot. Talking about Sniper's new love to talking with Alexa, Francis was quoted in a TOI report, "He goes up to the two Alexa devices and, by now, knows to give out a couple of basic commands, like 'Alexa call Shijin." Sniper knows the exact responses to Alexa's next question. Lily mentioned that the parrot may not understand the concept of time but he still asks Alexa what time is it. When Lily sometimes makes a video-call to Shijin, Sniper sits on her shoulder and asks "Who's that" while he looks into the phone. Sniper's liking and interaction towards technology is obviously entertainment for the family. He often peaks into their iPad and swipes on it with his beak. Although the bright colours do intimidate him sometime, he has grown a liking towards these devices. Parrot Swears at London Firefighter Who Was Trying to Rescue Him From The Roof! African grey parrots are among the most intelligent species and comprehend fast. 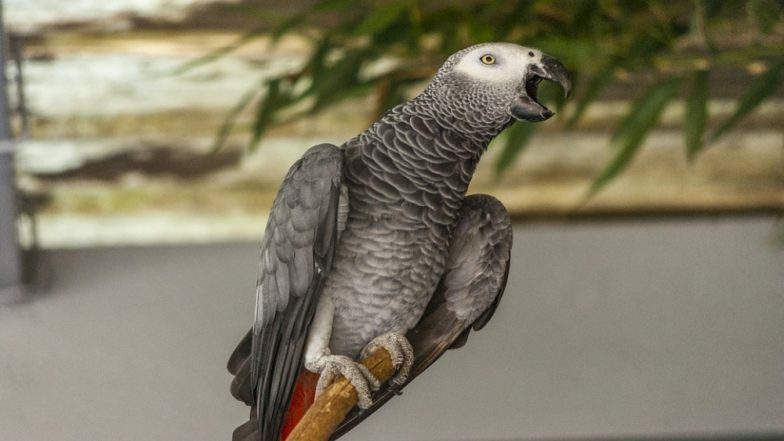 Sniper is not the only one who is well-acquainted with technology, there are cases of African grey parrots from abroad who are getting along with technology. A parrot named Rocco from Oxfordshire had not just befriended Alexa but also began ordering stuff from Amazon. This parrot also plays soft music and also dances to the tunes. There have been several cases where parrots have got along well with these devices while the owners are away.